Count on a Blue Haven inground pool to deliver more than you ever imagined for your backyard resort. Along with enjoying an affordable, custom swimming pool & spa with superb beauty and value, you will appreciate having peace of mind. It’s the kind of confidence that comes from choosing the most-trusted name in swimming pools—the recognized industry leader with projects that are backed by rock-solid warranties. After all, our familiar Diving Lady symbol represents a name upon which tens of thousands of U.S. homeowners have relied since 1954. Advantages like the ones outlined here are why so many homeowners make the smart choice and turn to Blue Haven professionals for a new pool design or pool remodel. Advantages like these are why across our nation this year, more Blue Haven pools will be built than any other gunite pool! 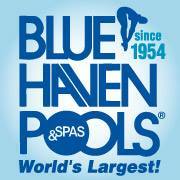 Are you the owner of Blue Haven Pools & Spas - Dallas?